My favorite orange sweet potatoes are uncommon in the Lake Atitlan area. We find them now and then, along with a purple variety, but most of the sweet potatoes (camote) here have white flesh that becomes yellow when cooked. They’re not bad, but they don’t have the body and depth of flavor of the orange variety. On a recent trip to the Panajachel market, we saw a big pile of orange and purple sweet potatoes; we did a sweet potato happy dance before buying several pounds. Now, with this mother lode of tuber happiness, what would we make? 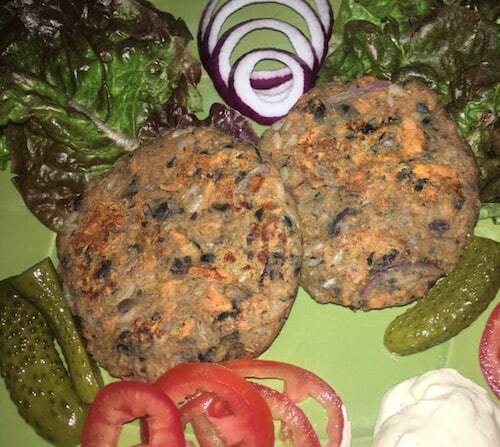 The answer came the next day, as I suddenly got a craving for sweet potato black bean burgers. I’ve been served both excellent black bean burgers and some really terrible, mushy ones, so I experimented. With the two main ingredients already decided, I just needed to decide on the spices and a binding ingredient. Grains of all kinds can be used as a binder. Some recipes use bread crumbs, others use quinoa, millet, or brown rice. Other rely on flax “eggs” to hold the burger together. I’ve used both brown rice and quinoa with great success. I’ve also used ground sunflower seeds with some ground flax seed instead of grain. The spices of cumin, garlic, and smoked paprika gave the burgers an earthy, deep flavor. The result was better than I’d hoped: the burgers were firm enough to hold together during cooking and on the plate, and absolutely delicious. Cook the sweet potatoes in any way you like. I roast mine whole in the oven, but you can cut them in chunks and roast or boil them. I think roasting brings out the flavor better than boiling. You can bake the burgers, or you can pan fry them. I used a non-stick pan with only about 1/2 tsp refined coconut oil to give the burgers a slightly crisp crust, but that’s completely optional. You can also grill the burgers; refrigerate them for about 1/2 hour first so they hold together better on the grill. Form 6–8 patties with your hands and set them on a parchment-lined baking sheet. If you’re grilling the burgers, put the baking sheet with the burgers in the refrigerator for about 30 minutes. If pan frying, place the coconut oil in the pan and heat over medium heat. Place the burgers in the pan and fry for about 10 minutes, flipping them over after five minutes. If grilling, grill over medium heat until the burgers are heated through and slightly crisp on the outside. Serve, with or without a bun, with your favorite toppings: lettuce, pickles tomato, mustard, and avocado are our favorites. Another nice addition is 1/2 recipe of our Favorite Mayonnaise spiced with your favorite flavor. Try chipotle, curry powder, smoked paprika, or berbere to give the burgers extra kick. Sounds just good enough to try!